This series of videos was shot during Erle's instructor's classes. The traditional way that one would learn Tai Chi, was to not speak. You would simply watch and join in behind your instructor as he would perform the form movements. This way, you would pick up a little each time physically with the sub-conscious body remembering and taking in the inner movements of the instructor. This is why they say that it took some 6 years just to learn the form. In modern times, we had to have a way to teach it a little quicker, so the form was broken down into components and taught as individual postures and movements. Of course the form can only be taught like this if you train with your teacher every day for hours, if you are learning from a once a week class for example then this way of teaching will never work. 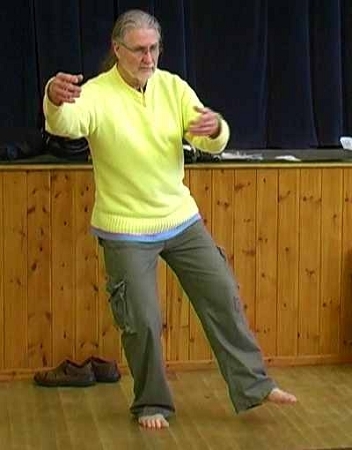 Or as Erle does in this video series, he teaches in this more traditional sense only to those who have already been training for many years and have the basic mechanics of the form already learnt. So you have two sides of the learning way. So Erle decided after 40 years of doing this stuff to take the middle road and teach this wonderful art to a handful of dedicated students, in a semi-traditional way. So we took the form and broke it down into a number of parts whereby the student would watch, then join in and allow his or her body to pick up internally what was happening. Then after some time, we would stop and take a look at this module and make any corrections and give advice before going on to the next module. This way has worked out really well with all saying that they found it challenging to leave behind old ways of learning but also very rewarding in that their body would pick it up much quicker. So here we have the first 4 modules of this method of learning, which is also a more advanced method encompassing all of "How We Do Tai Chi". The waving form, the spiral or Silk Reeling Form, the Stone Hands Form etc., This is simply How Tai Chi Is Done. It doesn't replace the old breaking it all down method of learning as most will probably wish to stick with that way. But for those who wish to take this art into the sub-conscious realms, this might prove invaluable. And even when you have already learnt the form to a degree in the old way, it is quite challenging to learn it this way and many of our most senior instructors found this very helpful to their understanding.